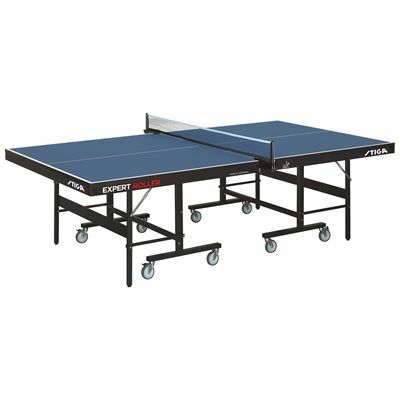 The Stiga Expert Roller CCS ITTF is a high quality indoor table tennis table with an ingenious Compact Storage System (CSS) for easy storage and handling. It features an anti-glare 25mm fibreboard playing surface and has been approved by the International Table Tennis Federation. This sturdy table with a stylish, modern design offers excellent bounce characteristics and comes with a detachable net with height adjustment. The locking system keeps it securely set in place and the steel frame makes the table durable and ready to withstand some really serious play. The Expert Roller weighs 114kg (251.3lbs) and provides convenient transportation thanks to 8 hard wearing wheels. In addition, there is playback facility allowing for solo practice. for submitting product information about Stiga Expert Roller CCS ITTF Indoor Table Tennis Table We aim to answer all questions within 2-3 days. for submitting product information about Stiga Expert Roller CCS ITTF Indoor Table Tennis Table. We aim to answer all questions within 2-3 days. If you provided your name and email address, we will email you as soon as the answer is published. for submitting product review about Stiga Expert Roller CCS ITTF Indoor Table Tennis Table.